"Our District is excited to implement a program that will not only save us $14.7 million in energy costs, but also allow us to demonstrate the positive fiscal and environmental impact of leading-edge solar and energy storage solutions to our customers across Fresno and to other public agencies statewide." Selma-Kingsburg-Fowler County Sanitation District (SKFCSD) is a public agency that provides collection, treatment, and disposal of wastewater from residential, commercial, institutional, and industrial customers within the service area. Approximately 42,000 people are served by SKFCSD, through nearly 11,300 connections. The wastewater treatment and disposal facilities are located on a 550-acre site in Fresno County, California. In February 2016, SKFCSD worked with ENGIE Services U.S. (ENGIE) to conduct an Opportunity Assessment for a comprehensive project to reduce energy expenditures and positively impact the environment. The contract was approved in October of 2016 and construction began in mid 2017. More than 2.4 megawatts of solar photovoltaics (PV) were installed at the Wastewater Treatment Plant, along with a solar parking structure at the Administration Building. Battery storage and other key energy efficiency measures such as HVAC unit replacements and LED lighting retrofits supplemented the solar implementation. The ENGIE Services U.S. team has worked closely with their sister company, ENGIE Storage, on sizing the battery storage component of this program. The largest part of the program is the ground-mounted solar system installed at the Wastewater Treatment Plant. The system tracks the movement of the sun throughout the day, ensuring maximum renewable energy production and streamlined costs using the proven tracking technology. By installing the system under Net Energy Metering (NEM), the District receives full compensation from the utility, Pacific Gas & Electric, for all the electricity generated by the solar projects at any time. ENGIE also worked with SKFCSD to design the system to accommodate future plant expansion. In addition to the large groundmount system, a 38-kW solar parking structure at the Administration Building provides District employees and visitors shaded parking spots with additional lighting under the canopies for enhanced nighttime safety. The 500 kW/1,000 kWh battery storage system allows for cost savings from reduced demand charges and secures solar investment with improved performance. It also avoids unfavorable tariff rates and supports process control at the Wastewater Treatment Plant with no manual demand shedding. With the new battery storage technology, SKFCSD will avoid paying peak demand charges from the utility by flattening its load. 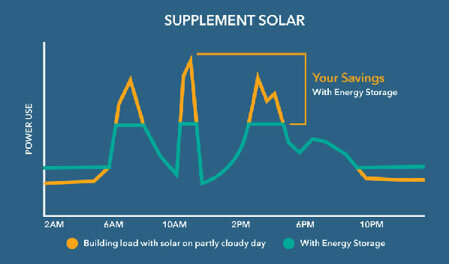 This graph depicts grid draw for a facility with solar on a cloudy day, with and without energy storage. The orange line represents the original facility load and the green line represents the new flattened load with energy storage. The $9.8 million program was financed with Clean Renewable Energy Bonds (CREB) at a low interest rate. Additionally, SKFCSD took advantage of the Self Generation Incentive Program (SGIP), a ratepayer-funded rebate program overseen by the California Public Utilities Commission, available to retail electric and gas customers of California utilities. ENGIE conducted an Opportunity Assessment to identify potential avenues for maximum savings. ENGIE and SKFCSD collaborated to develop the program. The SKFCSD board approved the Energy Services Contract. Hi, Please send me more information regarding the Success Story for Selma-Kingsburg-Fowler County Sanitation District. Thank you!